This is another delicious and popular mushroom. This mushroom has a lot of look alike. 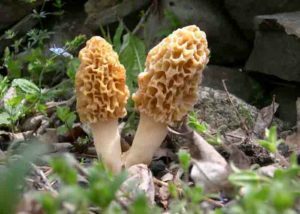 So it’s important to know the real morels mushroom. Here are a few easy steps to identify them. Growing habitant: These mushrooms usually grow near ash, elm and apple trees. Growing time: These mushrooms usually grow on spring time. They usually fruit from February to June. Cap: The cap is longer than the stem. It’s covered in pits and ridges. It’s often times longer than the stem. It’s also attached directly to the stem. Spore: The spore is usually light, cream to light yellow color.